This notion of divided rights and responsibilities comes to mind as I ponder concepts of community, particularly the construction of bi-cultural (or otherwise divided) communities organized around a humanitarian need. Membership in a community is much like citizenship in a nation: it comes with a certain set of rights and responsibilities. If I am a member of a group—say a board of directors or an alumni association—I can expect to receive certain information or opportunities in exchange for my commitment to help as I can. Some memberships come with higher levels of expectation than others, but present in most is an assumption of mutual assistance. Members of bi-cultural NGO communities also have rights and responsibilities, but like with the Mexican man, they are divided across borders. These communities live under the strain that comes from the reality that we have most of the rights while our program partners have most of the responsibilities. The simple fact that we control the organizational pursestrings, as beneficent as we may be, gives us power over the local project. Money comes with reporting requirements, resulting in a high level of responsibility on their end to have clean books and clear results, let alone the responsibility of running an effective social change program within a turbulent society. While we sit at our desks (working hard), they are dealing firsthand with the risks involved in working with impoverished people, not knowing if there will be enough money next year to continue the projects for which they stuck out their necks this year. 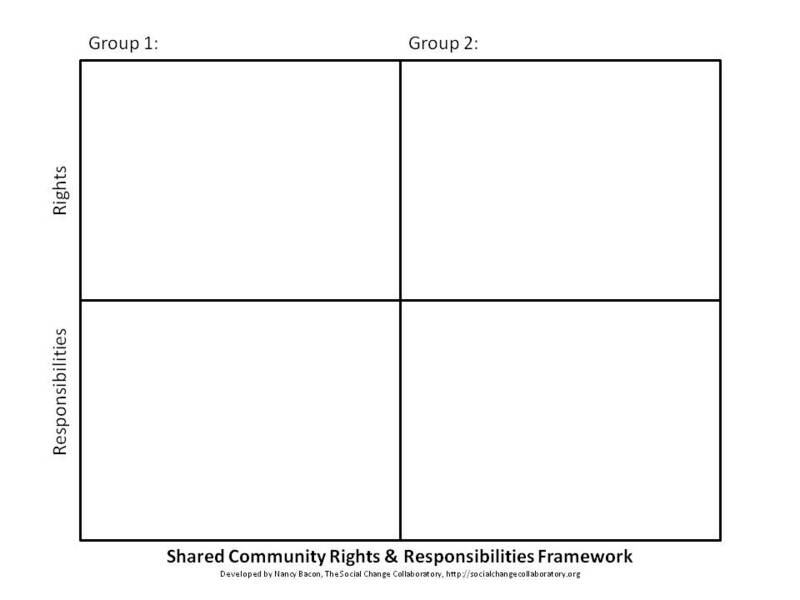 Structure: Peter Block, author of Community: The Structure of Belonging, reminds us about the importance of creating structures that support the practices necessary in talking about such things as the rights and responsibilities of community members. Small non-profits are indeed fascinating because they are structured communities—individuals with a shared interest who have gone through some formal process of incorporating into a structured group in order to better achieve their goals. They evolve from an informal gathering of people into boards of directors, by-laws, and budgets. Integral to this evolution should be the on-going conversation about the balance of rights and responsibilities among all members of the group, both in-country and internationally. Creating a structured way for this conversation to occur will better ensure its place on the community agenda. Reciprocity: Given the reality of money and power, it seems that the best way to offset the imbalance of rights and responsibilities between local and international partner is to increase their rights while increasing our own set of responsibilities. They know what rights they would like, though they may not think about them as such. Last I had this conversation with a partner, I heard a request for certainty around multi-year funding so that they could run a pilot program for at least two years. This partner wanted access to financial information to know whether he could expect the same level of support year-to-year. He wanted to hear about international opportunities to travel and join a larger network of like-minded people. In most cases, partners want to feel a sense of dignity that they are a part of the leadership team. What can we offer in return? A commitment to be fully transparent about funding so that they know two years in advance if there will be enough money to start that pilot. We can be deliberate in bringing our community of funders and volunteers along with them as they risk their social capital in the launch of new social change projects. We can choose to be accountable to them as much as we are accountable to our own boards of directors. There exists no international body that governs partnerships between non-profits here and there, so we have to create our own governance compact that articulates a clear set of beliefs and actions that support a more balanced set of rights and responsibilities. Of course, in that evolution from community to structured non-profit, concepts of community can get lost under the files of annual reports and board minutes. The round circle of collaborative decision-making can be replaced with the hard edge of hierarchy as communities grow to achieve efficiencies. Such shifts make conversations about rights and responsibilities irrelevant because we no longer are discussing communities. On the other hand, we can create structures and tools for reciprocity that embrace the power of community and the assets that a motivated group of people bring to any project. I think back to the Mexican man. He came to the U.S. because he faced limited opportunities at home. As we partner with international projects changing political and economic landscapes to create new opportunities for would-be migrants, let’s recast the imbalance of rights and responsibilities and build lasting communities based on greater equality. This entry was posted in communication, non-profit management, risk. Bookmark the permalink.